The toga is a staple for many Roman, Greek, and other costumes, and a toga costume shop or rental store can provide various options for the perfect historical garb. Togas are loose fitting wrap-like garments that were the formal dress for ancient Etruscans, Romans, and Greeks. While the most common toga was a plain white robe, embellishments, accents, and colors were also added to the garment to represent different things, such as a broad purple stripe for those of a high ranking, purple and white togas for kings, and togas with scarlet stripes for priests. Dark togas were worn for mourning, but aren't typically seen in today's costumes. Modern Roman and Greek toga costumes are usually white, often with sashes or overlays, and may have various embellishment such as velvet borders or gold detailing. Both short and long and men's and women's toga styles are available. Although not as common, some shops also have children's toga costumes as well. Togas may be wrap style or tunic-like in style. Available accessories often include faux laurel wreaths for headwear and sandals. Costume SuperCenter includes a Greek and Roman section with white and colored togas, Roman senator toga ensembles, and exclusive deluxe togas or men and women. Costumes of Nashua has a shop section for Roman and Greek Costumes that includes several types of togas. Includes both high quality rentals and affordable toga costumes for purchase. Annie's Costumes includes a Roman Era Costumes shop for men and women, with various togas and accessories. Whether you're looking for a basic short wrap-style or tunic toga or an elaborate Roman senator's toga, Fun and Folly's Greek, Roman and Egyptian costume page has a good selection to choose from. If you're looking for something for re-enactment or theater purposes, a costume shop specializing in togas and other Roman and Grecian apparel might be the answer. 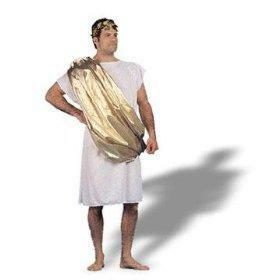 Although the cost can be significantly higher than more inexpensive togas designed for Halloween and parties, these costumes have the appeal of authenticity, quality, and close attention to detail. LaWren's Nest: A costume shop specializing Roman, Greek, and Celtic re-enactment costumes that sell wool and linen citizen and senatorial toga costumes. Garb the World specializes in historical costumes, and sells a variety of togas. Costumes are custom made, affordably priced, and made in the United States. The Toronto-based Theatrix Costume House offers high-quality rental toga costumes, but you'll need to call about availability.